PowerPort Atom PD 4 wattage? So, you're saying Anker is not like Apple after all ... i.e., at least Anker is advising why the Atom is delayed, versus Apple's radio silence on AirPower. Anker is not taking cues from Apple as they are being very clear that they pulled the product for improvements. Apple meanwhile always has a tendancy to dangle the carrot but never show it until it is perfect, or if its a failure it gradually fades away. Ok, so it looks like the USB-C ports themselves are capable of outputting up to 100W. Both A ports are PowerIQ 1.0 so capped at 12 each. That leaves 76W for PD when both are in use. I was really hoping that the PD 4 would support up to 100w if there was only one port in use. My 15in MBP came with an 87w behemoth of a power brick. I was hoping for something smaller, but still as powerful. Any detail about dimension and weight? So you see there a 20V 5A 100W mode, so yes single port used gets 100W. The lack of clarity is how it shares it "intelligently". Assuming these are all the PD modes then imagine two PD devices, well then you're looking at a little wasted power because for example two ports at 15V 3A 45W leaves 10W wasted. So if you used 2 PD ports you'd need something wanting no more than 10W to be happily using all the power. You can imagine say you had one PD device and something non-PD well if these specs are the full information than that 20V 5A 100W has no choice but to come down to 45W and the simple act of plugging in anything to that Type A ports which cannot take more than 5V 2.4A 12W means you are using at most 45+12=67W so 33W are wasted. So there must be more to this than the Amazon blurb. They must be keeping voltages at these discreet levels and reducing current to not have wasted power? The issue then is the interoperability with the PD devices, imagine Anker in the 1 PD + 1 A scenario gave 12W to the A port so 88W left at PD port well you'd to give out 4.4A 20V not 5A 20V, so how would the device feel about only 4.4A at 20V? Would it then decide itself to go down to 15V and so only take 45W and not 88W? At this point we need the product in hands of reviewers, with USB PD meters and lots of PD devices and measure. Also notice there is no mention of Gallium Nitride on Amazon... Makes me suspicious. If the chipset used for pd is anything like the TI one below you would just limit the current through signals. On page 14 for HV current cap, you can use setting 12 and cap the port at ~4.1 amps. The voltage is the same but you dont exceed the 100W rating. I would assume something similar is in the design. Incidentally this chip is how you would do PD, so on our other page you discuss costs, this chip is closer to what you need and cost much higher than usb micro designs (this is a microcontroller with programming). Indeed. If they were using it you'd expect them to brag about it. Oh I know you can lower current, but what does the device connected think of that? It is a negotiation which be a race to the common bottom denominator. You'd need an intelligent device to get the best out of the intelligent Atom-4. e.g. device is perfectly happy at any voltage any current within certain minimums, so a device capable of 100W saw 20V 4.4A would be perfectly happy. At some point, say around 2.3A, if current dropped it would ask to renegotiate as there is a stepping-down inefficiency in the device of needlessly high voltage and so may take 15V 3A instead and everyone gains less heat waste. I don't see anything more we can do that just check our device compatibility in reviews or wait for Anker to list them and if it doesn't work then instant refund. At these prices ($80 I suspect) it is an expensive experiment. It will take a while to be sure. Sort of, the renogotiate comes if the current is too much (in my case my v35 adjust down to 9V1.8A with PD and QC). If your supply is 5v1a supplied to a system that takes 5v2a, provided the voltage is there it wont care much. The chipset sets voltage to make device happy and then feeds current. Heck, you could put 20v1a and your device shouldnt really care much, just take forever to charge. The voltage levels are most important, the handshake sets up what voltage a device can take. QC does this, but after getting voltage will repeatedly ping and adjust current to get optimal level, if you attached one that could handshake but needed higher current then the charger would lock at max current and be done. The Q&A section at Amazon now has an answer from AnkerDirect, who says it doesn't use GaN. Makes sense. It is huge! I sent mine back, it was too large and weighed more than all my chargers combined. was a great idea. still looking for USB-C charger for my laptop. You're one of the brave few who both tried it and returned it to make Anker aim higher. If you're technically interested, the problems are all 100% predictable, the product never needed to exist to predict them. Surface Area for cooling goes to the square of volume but heat goes to the cube of volume. So bigger items cool slower than smaller items. The challenge with a 100W charger is you have to make it more of a thinner slab to make its surface area thus bigger again, but even so you end up with more casing than you gained from consolidating. The only way big chargers make thermodynamic sense is if you pack them with more efficient electronics. Anker has done the exact opposite. They 1st released the Atom 1 with the latest most efficient electronics, where smaller size has the least need of the benefit, and 2nd released the Atom 4 with the older less efficient electronics and so required to make it even heavier and bigger to compensate. 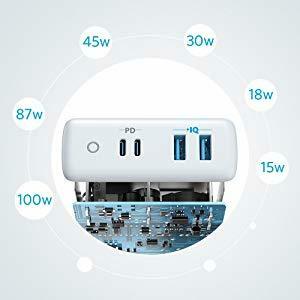 I would also challenge if a 100W 4-port charger even needs to exist. If you owned 1 device needing 100W, it would not likely leave home, you'd likely have it on a dedicated charger to solve the heat problems of consolidation. You'd likely be wanting say a 45W-60W charger which can do 60W to 1 port or spread them out. Anker makes 60W chargers now, not too large, plenty of space on their sides to place 3-4 ports. My laptop stock pin-type charger is 65W and unraveling. hopefully, less than 65W on USB-C will work ok. usually just overnight charging anyway. I will need something for the next trip. when I asked Anker about lower wattage USB-C charger, they looked at specs and said it needed to be 65w. the manual says a phone charger will charge it. 60W 3-port would be fine. even 2-port would work. one USB-C and one USB-A. One of these two because they support 30W output via PD. PD 1 looks interesting. 30w.